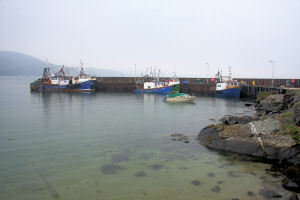 Carradale is a busy fishing harbour on the east coast of Kintyre, opposite the Isle of Arran. This is very much a working harbour. A plaque on the harbour wall pays tribute to the crew of the Carradale-based fishing vessel Antares, lost to the sea off Arran in 1990, accidently sunk by a naval submarine on manoeuvres.